This essay was published in the 2009 issue of Philadelphia Poets. And so we were standing there looking at the shadow of our own planet  and ourselves and the others scattered across Earth who were looking up, and all the buses and expressways and skyscrapers and rivers, so small there in the immensity of our collective shadow. I have to admit that Im not the most scientifically informed person. 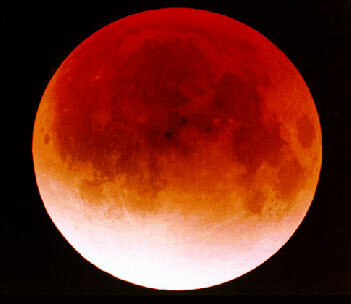 And as for lunar and solar eclipses  Shakespeares comedic title, Much Ado About Nothing, comes to mind. 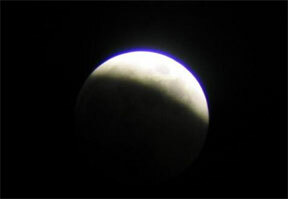 Any eclipse by definition is something that is not there  as in the case of a shadow that is cast over the moon. I am an urban person. If Im not mindful, I tend to live my life like a rat in the race and I rarely look up  especially after dark. There are reasons for this. On the night of the lunar eclipse, for example, it would have been futile for me to look up when I was waiting for the bus. I was standing at the corner of 15th and Walnut Streets in Center City Philadelphia and even if I had stepped outside of the bus shelter, the tall, close buildings around me would have obscured my view of the moon. As it was, I didnt know anything about the eclipse, until I was on the 9 bus, which runs from Center City to my home in the Northwest section of the city  about a twenty minute ride. I cannot stop myself from eavesdropping, and whenever I am on the bus  when I am not listening to my Spanish lessons or humming (sometimes unconsciously) along to the music on my iPod  this is my favorite thing to do. I was sitting in the seats toward the front of the bus -- the ones with lots of leg space in the middle aisle  that face the opposite windows. I was going home after teaching my continuing education night class at Temple University Center City and it was after 10 p.m. Late in the evening, the bus culture is entirely different than it is four hours earlier, during rush hour. There are fewer passengers  tonight the bus is less than half full  and the atmosphere is entirely casual. People are friendly. We talk to each other  and to the driver, who smiles back and talks to us. In part, it is different because late in the evening everyone is too tired to be in a hurry. But it is also a late night sea change. It is entirely more like a laid back trolley car experience on Canal Street in New Orleans than a typical bus ride anywhere on the Type-A East Coast. but then I heard one of them say eclipse. Then I heard the word again  eclipse  this time it was from a man sitting next to a woman in the middle section of the bus. It was like an echo. We were still on Walnut Street  moving out of the congested business section toward the Schuylkill River  where the river-wide gap between the tall lit up buildings suddenly looks like wide open sky. I noticed that people standing on the street were looking up. Even though the glass of the bus window was between us  I could sense the expectancy. Then he pulled over and stopped the bus. About half of us  those who werent reading or plugged in  climbed off the bus and stood on 30th Street, high above the river, and looked up. There was a cloud across the moon with a kind of hazy red reflection in a perfectly round shape that was superimposed on the moon behind it. Theres a planet between us and the moon, said the driver to the man next to him who said, I think its Venus. The mention of this goddess and planet passed from person to person  this is how rumors get started. Later, I would learn (or re-learn) that the shadow we saw was not a planet  it was in fact the shadow of the earth falling on the moon. We were points of darkness in that shadow - so small that we couldnt even see ourselves as we stared up  watching what we thought was the perfect orb of Venus casting a gradually creeping shadow across the surface of the moon  until the only remaining moonlight was a perfect sliver around the top edge  a hard, bright, light. We stood there silently until the driver shrugged and said, well, its time to go, and we followed him back onto the bus, that he had left running. He made his last stop before the Expressway, and we followed the same trajectory home that we always do on the 9. But there was something different in the ease in which we sat on our SEPTA issue blue bus seats, and in our wide open smiles, and in our willingness to make eye contact with each other.